Product information "HAIX Airpower XR200"
The Haix Airpower XR200 is a pair of oil resistant and waterproof work boots, made of nubuck leather that gives it stability and allows the foot to breath. The composite protective toe cap helps prevent foot injuries, especially to the toes. The para-aramid cut protection system helps keep your feet safe while working with the chainsaw. The Secura Liner® keeps feet cool with its breathable material made of GORE-TEX®, and ensures that your inner boot lining will not wrinkle, pull up, or pull loose from your boot. The inner liner is waterproof and useful for keeping feet at a balanced temperature. The Climate System ensures a continuous air circulation in the footwear. ‘With every step, fresh air will be pumped into the boots and heat will be pressed out of boots through the vent holes at the top of the boot. Designed by HAIX®, the Arch Support System keeps your foot properly supported, and protects its natural curvature, making the boot comfortable to wear for extended periods of time. When you need to move and stretch, rely on the HAIX® Flex Protection System; the heel area is reinforced with leather in order to protect the bend, yet allow the foot to make the wide range of natural movements necessary when working or hiking. The midsole is made of non-metallic and flexible material which is puncture resistant. The rubber sole of these electrical hazard chainsaw safety boots is self-cleaning, long lasting and extremely slip resistant. Built in electrical hazard protection can potentially reduce the danger you can encounter if you come into contact with live electrical circuits. Related links to "HAIX Airpower XR200"
Customer reviews for "HAIX Airpower XR200"
I bought myself a pair of Missulas to work on the fire line during forest fires in our parks. I found them so comfortable and fast break in time. So when it came time for me to purchase boots for the other park employees to do chainsaw work, i found the Airpower R200 cut resistant boots. They all loved them. I have purchased over 100 pairs of chainsaw boots and the R200 is the only boot that is requested these days. I will start by saying the XR 200 has the most support of any mid height boot I have ever worn. They are so good I am on my second pair. My first pair developed a crack in the leather at the sole to upper junction behind the composite toe at around 6 months of everyday wear. I continued wearing them with thinking sooner or later my feet will get wet and I will need to make a warranty claim. My feet did not start getting wet until the 3rd winter in the them when the crack had opened up. Spring of 2015 to January of 2018 RIP XR200-1. I purchased another pair identical and didn't look back. Best value for the money period. If you ever need a great pair of boots look no further. I’ve been wearing these boots for two weeks and I had to write another review. Since the wind storm I have racked up 146 hrs in two weeks and I’m extremely happy I bought them.. These are my first pair of HAIX and def not my last. Only complain is I didn’t think of you earlier.. Thank you for making a great boot. I bought those boots 4 years ago in Germany and brought them with me to the US. They are very well made and high quality. For sure we are not talking about tennis here but for work boots with this high level of protection they are very comfortable. As I was traveling and did not have my Haix hiking boots with me I took those for a 7 mile hike in the woods of PA: very good and no complains. 100 % waterproof and perfect traction even on wet rocks. I would definitely buy them again. Ok, I’ll start by saying these boots are worth the money and then some.. I work as a high voltage eletrician (Substaions) and walk on uneven surfaces all day.. I received these boots on 3/1/18 the day before we got a wind storm in Virginia.. Storm fit on 3/2 and I was taken off my usual job to patrol lines in and out of right a ways, back country woods.. I place these boots on Friday and today is Tuesday and Haven’t taken them off (to sleep yes). Working 15 hour days and these boots are the best I have ever worn.. when going thru the “breaking period” I didn’t tighten them all the way, left them a little loose and I believe this helped during the first 20 hours of having them on.. I have worn different brands trying to find a boot that is comfy and also meets all my needs, water proof, safety toe and Eletrical hazard and doesn’t weigh 10 pounds.. These are the boots for me and really should be for anyone who wants awesome safety shoes..
I’m pretty mad that I didn’t think of HAIX at first..wore my first pair of HAIX when I was on Working for the firestation in Ma..
PS: buy the cleaning supplies because I wish I did.. Received my pair of XR200 boots promptly. The size I normally wear in boots, 9 1/2 fit perfectly. The boots are fairly stiff. I wore them around the house for a couple of hours for three days to check the fit and that was enough to soften the fit enough to wear all day. They are comfortable, have good lateral support and hopefully will help protect against a chainsaw mishap. The one piece leather body is great as there are no stitch lines to wear through and the rubber? toe cap really protects the toe when stumping. A top quality boot. We appreciate you taking the time to provide feedback on the Airpower XR200. We pride ourselves on making high quality products and are happy to hear that you like the boots. These boots can take a little longer to break-in due to the full-grain leather used throughout and we are pleased that after just a few days, the boots keep your feet comfortable and supported. I have had lots of different safety boots for work and have hated the toe box pinching my feet. I also have Plantar Faciatis and for the first time in two years my feet don’t hurt at the end of a 14-16 hour day. These are by far the best and most comfortable boots I have ever owned. I find myself using them instead of my hiking boots. I have a pair of USAR boots and find the insoles very hard and will be looking for the softer insoles on your website. Thank you HAIX, for a quality product. We appreciate your feedback on the Airpower XR200. We are happy to hear that these are the best and most comfortable boots you've ever owned. We are also glad that your feet no longer hurt after using our boots. We hope they continue to serve you well in the future. Thanks for your loyalty to the HAIX brand! I bought a pair of XR200 boots a couple of years ago at a Forestry and Logging expo near me. I was looking for something more comfortable than the rubber chainsaw protective boots I had owned for years. I rarely wore the rubber boots because they were so uncomfortable if I had to do much walking. The XR200 boots solved that problem. They are as comfortable as the best pair of hiking boots I've ever owned, and a pleasure to wear in the woods when doing chainsaw work. We appreciate your feedback on the Airpower XR200. We are happy that the boots are comfortable while on the job doing chainsaw work. And what a compliment that these are the best hiking boots you've ever owned! We strive to put out the best products and we are pleased that you feel the quality and craftsmanship are top notch. Thank you for your service and for being such a loyal HAIX customer. After becoming used to the quality of European made hiking and hunting boots I had to get a pair for myself to work in as well. I own Scarpa hiking/hunting boots and these are every bit as high quality. I needed safety rated boots for where I work and these boots seemed like a perfect fit. They're comfortable and feel mostly broken in after only a week, they don't slip on the wet coated concrete floors, and the gortex keeps my feet dry. Haix customer service was great in assisting me get the boots special ordered through a local vendor. This will not be my last pair of work boots from Haix. We appreciate you sharing your experience with the Airpower XR200. 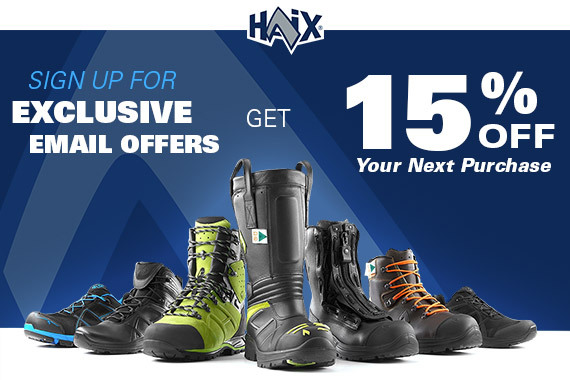 It's great to hear that you chose HAIX when deciding to purchase a pair of boots for your job. We are glad that the boots are comfortable, slip-resistant and that the waterproof liner is keeping your feet dry. Our customer service dept. prides itself on helping customers with anything they need and I am glad they were also able to assist you in placing your order. Thank you for being a loyal HAIX customer! Best work boots I've ever owned. These work boots are great. I have problems with Plantar Faciatis and these are the first boots I have worn that my feet do not hurt at the end of the day....I have actually found myself wearing them while not at work because they are more comfortable than any of my other shoes. They are very durable. I work in the heavy equipment/mining industry and usually go through multiple pairs of boots in a year. these have lasted 2 years and finally have the leather seperating from the soles. I am ordering another pair of these amazing boots today. Glad you have had such a great experience with the XR200 and that they have held up so well for you over the past two years. Also, happy to hear that you enjoy wearing them outside of work because of their comfort level. We appreciate your feedback and are excited that you decided to order another pair. We hope you will continue to be a customer in the future. I've been wearing these for the last 9 months and I am very impressed. These boots are very durable and supportive, but what really stands out for me is the arch support system. I have wide and flat feet which are always killing me by lunchtime when wearing any other boots. I've tried arch support insoles with other boots, but nothing helped. These Haix boots keep me going all day with no pain at all, thats a first for me! My only complaint would be that these insoles are very firm. I've read that some people have softer insoles from Haix, but I can only find the standard gray insoles on their website. Overall, these are the best boots I've ever worn. I just ordered a pair of the Airpower P7's and I hope they are as good. Thanks for taking the time to share your experience with us, we appreciate the feedback. The softer insoles should be available on our website within the next couple of weeks... In the meantime, we are sending a pair to you free of charge. Thanks for choosing Haix and have a great day. I have been looking for years for a boot like this. This is a steel toed hiking boot with a weight and build quality similar to offerings from companies like zamberlan or scarpa. the boot is light, comfortable and supportive and legal for me to wear on the worksite. They feel nothing like the traditional steel toed boots I've been enduring for years and often ditching as soon as the safety people had left in favor of a more comfortable pair suitable for walking around in the bush. Only time will tell how long they will last or how well Haix will support them if there is a problem but I can say that the build quality and design are excellent.